Ozy and Millie – Wisdom for short attention spans. Due to a few interrelated issues — mainly WordPress security updates, and ComicPress being abandoned and replaced by Comics Easel — I had to do a quick hack-and-slash update on the site. All the strips are still there, but the storyline and calendar archives aren’t currently available. Sorry about that. My friends at Andrews McMeel Publishing will do anything to make me happy, apparently. Or maybe they just think “Ozy and Millie” is good! One way or the other, tomorrow, August 28, a new “Ozy and Millie” book will be out, available wherever books are to be found. It’s full color, and the same format as the “Phoebe and Her Unicorn” books. I chose strips that I thought would be a good introduction to the strip and what it is for new readers, but I hope longtime readers will have just as much fun with these. I had fun collecting them–I actually laughed out loud, rereading these. Good job, young me! Just letting you know that I just completed moving the site to new hosting. This will hopefully add a bit more reliability once I get the kinks worked out. I have dealt with a large backlog of comments from first-time commenters (these go in the moderation queue, which I hadn’t checked in a while.) Due to the timing issues involved in DNS changes, there may be comments from the past week or so that have gone missing. Sorry about that. 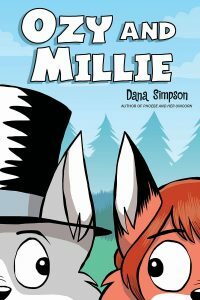 GoComics welcomes Ozy and Millie! It was originally suggested by Universal Press Syndicate honcho and excellent dude John Glynn, over pancakes, in December. Hey, folks. Just wanted to note that I catalogued another stack of strip originals; many strips from July, August, September, and October 1999 are now available for sale. Individual strip pages have information about whether the strip is available and the condition of the original. See the “purchasing artwork” page for details on how to buy.